SUBMIT YOUR WRITTEN OFFER NOW! 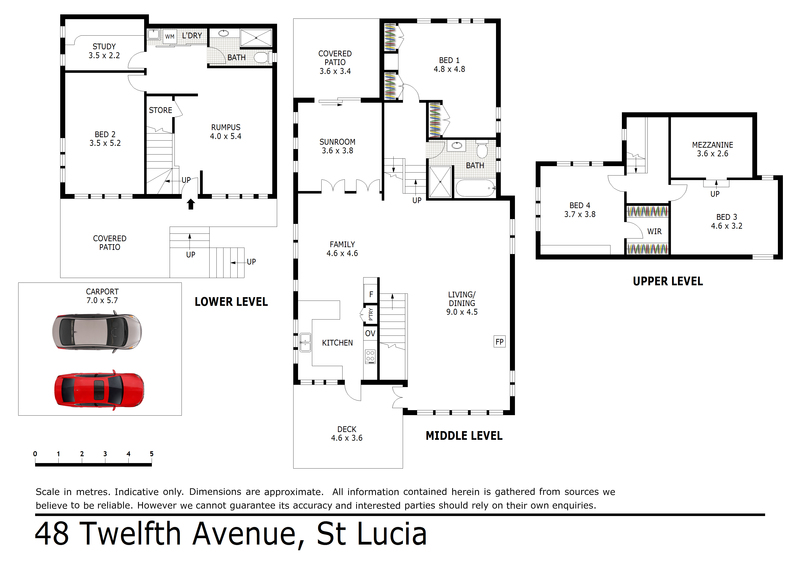 SELLER QUITS THIS PROPERTY, YOUR OPPORTUNITY TO PURCHASE IN THIS TIGHTLY HELD POCKET OF ST LUCIA! Charming Home on 708m2 of Land! This executive three-level residence sprawls across a large 708m2 elevated block in the highly sought after St Lucia, offering an idyllic location on the high side of Twelfth Avenue. Defined by its exceptional privacy and thoughtful combination of period architecture, attractive features and contemporary open-plan design. Immersed in tranquil surrounds, this impressive home offers a blend of spacious open plan living on its extraordinary land holding of 708m2 (dedicated BCC parkland opposite). This is a great opportunity for anyone wanting to enjoy a beautifully presented family home whilst having the classical elegance and charm for the years ahead. Superbly appointed throughout, this exceptional four bedroom home (plus study room on the lower level), provides the perfect refuge for any family wanting ample space and options. The upper level has it all, with its free flowing space leading onto the stunning indoor/outdoor entertaining areas. The master bedroom is generous in size and features a loads of wardrobe space, large bathroom with dual vanity’s and floor to ceiling tiles. A large kitchen featuring a Siemens convectional oven, stone benchtops, Siemens dishwasher, loads of cupboard/ bench space allowing it to become another hub of the home with its adjoining deck and family areas. A large lower level space gives your home exceptional options from a teenagers retreat, elderly parents, multiple home office facilities or an in-built multi-media room – the choice is yours. The lower level also boasts plenty of storage cupboards and space galore. In a blue-chip neighbourhood, the checklist is complete. This home is moments from Ironside State School and Guyatt Park City-Cat service and just a nine-minute drive to the Toowong Village and Indooroopilly Shopping Centre’s restaurant and cafe precincts. UQ sporting facilities; a tasty pizza from The Pizza Caffé; riverside walkways; iconic schools and colleges…so much so near can only underpin the future value of your new home. Inspect this blue-ribbon home today – prime opportunities like this are rare! The current owners are relocating South, so reluctantly, it’s time to sell up and sell they will. Homes of this calibre in this highly sought after neighbourhood certainly don’t come along often so for more information or to arrange your inspection call Elliott Dean on 0401 762 655. This property is being sold without a price and therefore a price guide can not be provided. The website may have filtered the property into a price bracket for website functionality purposes.